sometimes life bites!!! I decided to share my story here and in as many places as possible in hopes of helping someone else out here in cyberworld avoid making a similar mistake to the rather LARGE error I made today. As most of you might have picked up from my previous messages I'm a pretty careful person and things that I buy have to last a LONG time. So I wait until I can get what I truly want instead of just settling. Well my long wait for a Digital SLR finally was met this Christmas. My DH got me the most amazing Nikon D80 with a 18-135mm lens, along with a fabulous Manfrotto tripod with a pistol grip rotating ball head mount. This morning I was photographing the projects that needed to be sent off to Paper Crafts today. I needed to go to the other room to get something after setting everything up and taking a couple of pictures. Being that I was right in the main traffic pattern of our kitchen I wanted to be ubber careful that an accident wouldn't happen with the kids scurrying by, so I moved my camera, on the tripod, in to the corner. I made certain it was nicely settled and walked away. I had only made it maybe 10 feet, when behind me there was the most enormous crash. Yes - my camera had tipped over smashing it and the lens into little pieces all over the hardwood floor. Needless to say after the initial shock and more than a few tears, I have decided that I need to share what happened in hopes that someone else doesn't do the exact same thing I did. I had no idea that the weight of the camera could tip the tripod right over. This is a substantial tripod - it's heavy - but all of you out in cyberworld please know that there is a lot more to be done with a tripod than just having your camera securely attached. Unfortunately I had no idea that when I had pivoted the camera into a vertical position it extended too far out between the two legs. I still don't know how it happened, physics - gosh darn physics!!! I thought I was good at physics, but apparently I am VERY bad - it didn't even dawn on me! The weight of the camera and lens pulled the whole thing over. There wasn't a soul near it - it just toppled. So hard lesson learned - NEVER pivot your camera vertically and leave it standing on a tripod - even the best tripod in the world. I'm not certain if I needed to have a weight bag hanging from the tripod, or what I did wrong at this point, but needless to say I'm very sad. I have to hope that their is a miracle in the works out there and that perhaps I will be able to get a new camera, but this baby's toast! I don't think that it's even fixable based on the number of little pieces I see in the pile we collected. SO please be on the alert with your new camera gear and even if you think you are being careful, be just that much more careful! coloring brand spanken new designs that will be released January 1st!!! I am so excited about these! There is a little something for all tastes. Below is just a little hint of what's to come - I'm working on a new class kit featuring the new designs and Basic Grey Blush papers to make a fabulous Valentine's day gift and hope that I will have it up soon for all to oogle. This was just a quick little idea that struck while I was sketching out my class kit ideas. For this card I used the Basic Grey paper, scalloping the edge with the Create-a-Cut Scallop Blade, and emphasizing it with holes punched with the crop-a-dile. A little hint for all those of you who have purchased this cutter is that the little "teeth" on the right side of the crop-a-dile line up with the edge of the scallop and you can punch your hole perfectly centered each time. 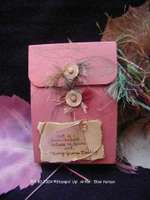 If you would like a picture of this please let me know and I'll show you what I'm talking about :D This was then layered on a Memory Box pink notecard - it coordinates perfectly! (hmm - perhaps I need to put this in the store - LOL) The heart was stamped on Fabriano, watercolored using Lyra watercolor crayons, and highlighted with the Sakura Glitter Pen. A little paper piercing, velvet ribbon and hardware, and voila - clean and simple! Before I do anything else I must finish the projects for Paper Crafts and get them out the door. THEN I can share the other new goodies that have arrived here on my doorstep - I'm extremely excited about the new stamps and stencils I have to share shortly! I was hoping to have the time to create something to share with you on this special day - the eve of Jesus birth, but instead I've been spending it with my family. A wise choice I believe, but still feeling a little guilt here. May the spirit of kindness, joy and peace be with you this blessed season!!! Good news ladies - the paper piercing stencils are shipping out today from the distributor. Sad news - they are coming from quite a distance and won't be here until next week Thursday(ish). Good news - I added some variety to the selection being that I now know that you love these as much as I do. Sad news - you are all going to be calling me an enabler again (LOL). Good news - I received a couple of special requests for projects for an upcoming publication. Sad news - yikes, what a time of year to start cranking out new projects! So with that I must run and get to work, right now!!! I so want to be able to put some eye-candy on here for you all to enjoy. Hopefully I can use something I reject in the next couple of days and hope that you find it worthy :D Have a wonderful Wednesday! Thank you all so much for your support and enthusiasm regarding the information I have shared regarding the use of the Wizard Charm Embossing kit together with your brass stencils and Cuttlebug (or other cutting/embossing systems). Unfortunately we have done it again - LOL! We have completely wiped out the manufacturer of these kits! But more are on their way via the slow boat :D In speaking with the Spellbinder owner it appears that more should be hitting the stores sometime mid-January. So patience girls - we must have patience. So 'til then perhaps we can focus our attention on other aspects of this fun little machine. I have some other things "up my sleeve" and hope that I can get enough time to share these with you soon! and other exciting new additions have been listed in my store. You ladies never cease to amaze me!!! I must report that the Wizard Kits and Paper Piercing Stencils are currently sold out! Please check back on Monday, December 18th to determine when more will become available. Thank you all so much for your continued enthusiasm and support of the unique products I am placing in my store! 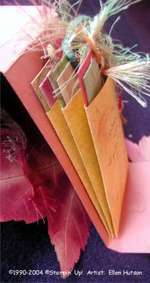 The teflon bone folder is something I use each and everyday in my cardmaking. I am going to take you back to one of my very first tool reviews to once again share my love of this little tool. I searched long and hard to resource these and have finally been able to find them to share with you. I am so excited to have these available for you in my store. When you fold your paper using this tool you will NOT leave a shiny spot on your paper where you use your teflon bone folder! Many of you have asked about the paper piercing on my card yesterday. To achieve the even spacing I definitely resorted to another wonderful tool I have discovered. This little template can be used in so many different ways. You can use it to pierce the pattern exactly as shown, pierce only portions of it, pierce and dry emboss, use only the edge detail to put a wonderful detail to your corners... the list can go on and on. 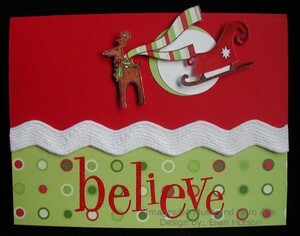 The second border template I listed at my store is the one I used on this card. 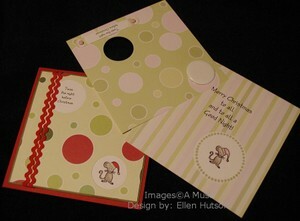 I love it again because of the wide variety of choices I can make with just this one stencil or template. Once again the precision is flawless. In the next few weeks I hope to share more of my passion for art forms from the past. Ornare, Pergamano, Spirelli - I love making the old, new again!!! The sheer beauty of these art forms can be brought into more modern applications and I hope to stimulate your creativity and teach you some new techniques to add to your already overflowing bucket of tricks. ETA: I almost forgot to mention - well I guess I did forget to mention (LOL) that I have added some of the Wizard Charm Embossing kits (link removed because these are sold out) to my store for those who haven't been able to find them. I do believe I started something because I noticed that the distributor that I ordered these through had them when I ordered and now they are all sold out. Do you think that word has gotten out that these work beautifully in the Cuttlebug machine? Here's another reject - LOL! I loved how the moon was punched to give it depth, the scarf to resemble reins (this was an idea from the Container Store ad last year with the little snowmen), the red EP making the word "believe" pop and then the subtle play on this word - being there is no Santa in the sleigh. Once again these are mostly A Muse images and the believe is a Hero Arts stamp. 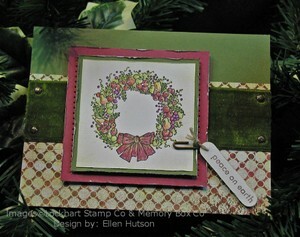 Paper is Memory Box Co and the wide Ric Rac is May Arts. I LOVE ric rac and don't use it nearly as much as I would like to being that sometimes too much of a good thing gets boring. The thing that I found fun about these is that the paper sort of resembles Swiss Cheese and I was able to punch the little hole precisely over one of the circular images in the paper and have the little mouse peeking through. This gives the inside of the card a finished looks as well. 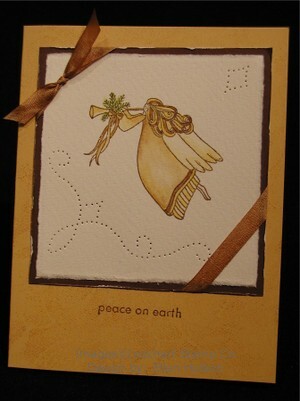 There is a special lady who inspires me and this card is made for her. Her courage and strength motivate me to keep my chin up when life circumstances are out of my control. This little message is being sent to wish her some peace here on earth during this special time of year, as well as for the year ahead. It needed to be fairly flat and so I tried to keep it simple. I love how the paper piercing adds some interest without being overwhelming, and this silk ribbon from May Arts is so easy to tie a knot with, and yet not be too bulky. I was bummed that I missed the positioning a little and didn't get the spacing quite right on the bottom right, but it was more important to get this in the mail than to perfect it. I'm trying to get past that perfectionism thing. Just a quick update for all those waiting for more information on the treat trays. A tutorial will be coming soon to Splitcoaststampers. I'm guessing that most of you know of this "magical place", but if not click here to be entertained for hours! I wish you ALL peace on earth this holiday season and in the year ahead! I promised you a little eye-candy and so here goes Ü You know when someone hits upon an idea and then it builds and builds until you end up exploding with ideas. Well this is one of those moments. I can NOT take credit for the genius behind these little trays - I give total credit for this inspiration to my wonderful colleague Karen Lockhart! It all started with the simple white tray with snowmen in the back corner. This was the design she shared with me. 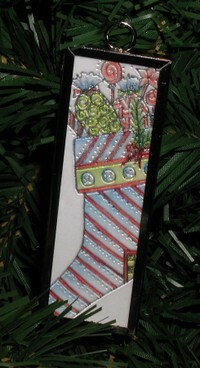 I couldn't help myself and had to try my Create-a-cut to embellish the edge, then my brain began exploding - LOL! Why not make it bigger, put a score and a fold, scallop the edge, punch some holes, sand it... STOP ALREADY Ellen you might say. So instead of blowing your mind right off the start, that is precisely what I'm doing with this picture tonight. I have more ideas that will be shared over time - I hope you all enjoy these little treat trays. 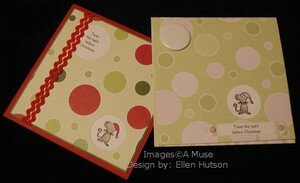 The basic project started out using the Memory Box 6x6 cardstock. 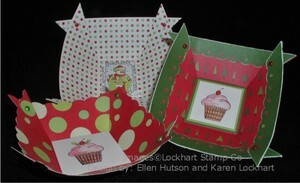 The two-sided patterned paper is ideal for these little trays! For the tray with the folded back accent I used the Memory Box 12x12 cardstock. The wonderful thing about these papers is that it has a white core and so when you sand it the white pops out. I'll share more projects in the future showcasing this wonderful feature. This project also features the wonders of the Create-a-cut and the Scor-It - both are tools that I am loving having in my crafting room, that I use on a constant basis. 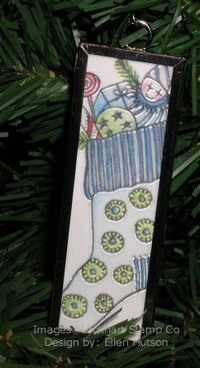 So let's try transparencies, grommets, ribbons to tie the corners - I challenge you to share your versions of this tray. The only favor I ask if you do make these is that you share the credit with Karen Lockhart! She is the most generous, amazing, creative genius and I have the great fortune of benefitting from brainstorming with her. Oh what fun we have!!! Please let me know if you think these little trays are something you would like me to pursue sharing directions for and I will try and draw up a little template to share the details being that I think this will be easier to understand than any "verbal" directions I could share. Update: I am happy to tell you all that the orders that were placed by 4:00 today have been successfully dropped at the local post office, therefore you can all start stalking your mail person :D. Thank you so much for your orders and I hope you have as much fun making your ornaments as I have! I LOVE to see those words! I just checked UPS tracking and the good news is that I should be receiving everything necessary today to get all these fun little "Frosted Ornament Class Kit" orders down to the post office and shipped out priority either late this afternoon or early tomorrow morning. I wish my UPS man would come in the a.m., but NO, I happen to be a late afternoon delivery for him. So if you have been stalking my site for updates please know that I am ready to roll with all your boxes, they just need the remainder of the frames and glass and they are out the door - Yippie!!! Also if you have been waiting to order you may want to jump on this opportunity right now. I haven't done the count down yet to see how many will be remaining after these orders are filled, but once they are gone, they're gone. So please don't wait to order. Well, I'm off like a shot to color more thank you notes and package up the little goodies that go along in your kits :D Have a wonderful day! This size frame is also suitable for the single cupcake - if you scroll back in time you can see the "Sweet Holiday Wishes" cards that I created using the cupcake with some holly sprigs. What a fun way to celebrate a "sweet treat" Christmas or give to that special someone who might have a birthday around the holiday season. I just find this little pup irresistable. My girls just fell in love with this one! So, if you want to commemorate the arrival of a new pet or just love puppies as much as I do - perhaps this is the choice for you. 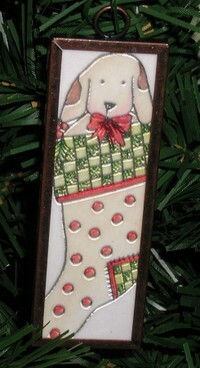 Remember that you can always substitute any of the other stocking stamps if you aren't a puppy lover. It is hard to see the polished chrome finish in this picture. I can not tell you how many times I tried to get a good picture to show off the frosty finish with all the details visible. I finally ran shrieking from my camera after the gazillioneth try - OK, so I'm exaggerating just a hair. But hopefully you can see the beauty of the details. I certainly hope that the new camera my Santa will be bringing me is going to make the needed difference. This is another option for the polished chrome ornament that I wanted to share. The details on the surface grabbed the light and just made it sparkle - they sparkle so much in real life! The perspective is off a little, but I thought it might intrigue you to see it despite the lack of excellent photography skills - LOL! To end I must share a sweet little sidenote with you all. Yesterday I was presented with a "wish list" for each of my girls. 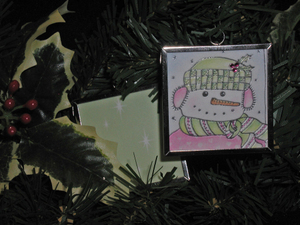 On both lists was a new ornament to add to their collection - they are so cute! They have been eyeing these ornaments as I have been creating them, analyzing each of them, telling me which ones are their favorites. I'm so lucky to be able to have them here alongside me as I work and create each day. They are my inspiration so much of the time. Their ideas never cease to amaze me and they really do love helping me box up your goodies and get them out the door. Well that is all but the trips to the post office - that they beg me to let them go to a friend's. Can't say as I blame them being the postal line is ginormous at this time of year, but you Canadian girls are worth standing in line for Ü Thankfully I don't have to stand in line for all my American friends though. Have a wonderful day and I look forward to hearing your reaction to these latest additions - thanks for stopping by! I have wanted to make this little card for some time now and decided yesterday that it WAS time! I just needed to create for me. So sitting listening to my new absolute favorite Christmas CD, Sarah McLachlan's "Wintersong", I turned the Lockhart Autumn Wreath into a magical Christmas Della Robbia Wreath. I've always loved the look of the sugared fruit and so once I had the image colored up I used my Quickie Glue pen and Hero Arts Prismaglitter on some of the fruit, the Sakura Stardust pen on some of the leaves and tendrils and voila Autumn has changed to Christmas. The paper is from my stash of Basic Grey Urban Couture "Loselle"; the brads, a beautiful brown glitter, and the paper clip are from KI Memories; and the sentiment is from Memory Box Co. I HIGHLY recommend running out and getting this hauntingly beautiful CD to brighten your holiday season. Great news ladies! I just placed another order for the products needed to complete the kits and I have my fingers crossed that I receive them by Friday at the latest. If you would like to place your order I will have your boxes ready to go and as soon as my shipment arrives I will box them, deliver them to the post office and get them shipped out priority to you. I am still in a state of amazement and am so thrilled that you are enjoying the packaging of the kit. All orders from this weekend will be shipping out today Ü I can hardly wait to see and hear about your projects!!! ...sung in my best "Frosty the snowman" voice. ETA: Oh my goodness ladies! I thank you all so much for your support! I only have one more kit available and then I'm going to have to post a notice saying please wait to order until Monday when I know whether I can purchase more supplies. I will be posting an alternate kit using chrome plates, but WOW I had no idea how excited you would all be. I THANK YOU from the bottom of my heart for sharing in my excitement with me. For all those who have placed your orders you are good to go :D They will be in Monday's mail and on the way to your house! 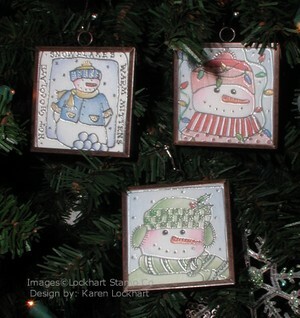 Karen Lockhart and I have been playing with these charming little ornaments for a few weeks now. Today I finally was able to sit down and put together my first class kit! I am so thrilled to finally be started on the next adventure in my plan to share the classes I am teaching, with others across the country (or maybe even the world - now that would be something - LOL!). I hope to get a better picture when the lights go on to the tree tomorrow or the next day. But for now here is the first kit. Each kit contains: step-by-step directions and visuals and one of the irresistable Lockhart Stamp Company snowmen (or lady). Memory Glass (24 pieces) is textured on one side to create a translucent, frosted look. The antique copper hinged frame (9 frames) comes complete with pre-soldered, matching jump ring. Finished size of glass and frames is 2" square. In addition to the items listed above you will need a Versamark pad, clear embossing powder and color pencils to complete this project. Following are three more little pieces of inspiration that I found on Karen's tree this week and she encouraged me to photograph them so that I might share them with you. These were hung randomly on her wonderful little snowmen filled trees - interspersed with "real" snowmen, snowflakes and twinkly little lights. It was definitely a magical setting! 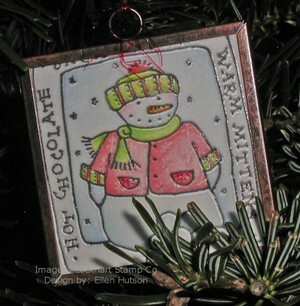 I hope you have as much fun creating special ornaments for friends and family this year, as I have had preparing these!